Ever since I went to Italy I’ve been obsessed with eggplant (growing up I just wasn’t so much- for no reason, but it wasn’t a mainstay in my house growing up).Like absolutely obsessed. I know it’s a nightshade and isn’t right for everyone, but if you can have it- at least here and there, and you make it right, it’s like candy. 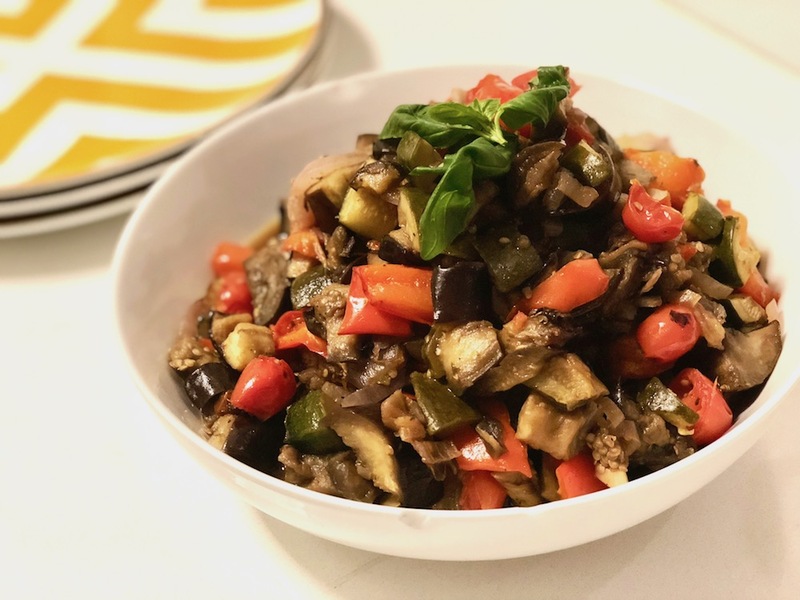 It’s also an affordable food item that can be made into larger quantities so it’s great to serve to parties and dinner parties- especially when made into a simple roasted ratatouille- like this one. What I love about this recipe most is that I baked the heck out of this ratatouille and so all of the veggies are SUPER soft and caramelized and delicious. And truly, the longer this recipe sits after cooking- the better it is. So days after you make it, it keeps getting better and better. I often pair this yummy recipe with a roasted salmon or chicken dish- but its up to you! Try this recipe and we’d love to know what you think of it. Cut and prepare all ingredients- eggplant, garlic, onions (yellow and red), bell peppers, zucchini squash, herbs, salt, pepper, olive oil – and add to a large bowl then toss to combine. Spread the ingredients onto 1-2 cookie sheets (however many it requires). Place the cookie sheets into the oven, and roast for 35-45 minutes (until all the veggies are soft. Lower the temperature of the oven to 425 degrees F and continue to roast for another 15 minutes. Next, add the cherry tomatoes to the baking sheets and toss together, then continue to roast for another 15 minutes on 425 F.
Remove the cookie sheets from the oven and allow to cool on the counter (place in fridge if you make ahead of time). Serve and enjoy! (if you are serving at a later time, re-heat in the oven at 350 degrees F, 15-20 minutes or until warm and hot. Garnish with the basil leaves before serving. Get more sides and veggie recipes here!